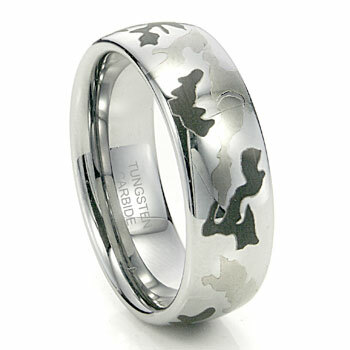 By popular demand, we now present the military camouflage men's tungsten carbide wedding ring. Measures 8mm wide and offered in various different sizes, our laser engraved camouflage ring will always look as perfect years and years in the future as it does the day it arrives at your home. Tungsten is so strong it is used in military applications as well as commercial oriented projects. Our military camouflage men's tungsten carbide wedding ring will not fade, tarnish, scratch, or misshape. Q: How much does shipping cost ? Shipping is free. Hope this helps! It's absolutely beautiful and stunning, I work in the rough end of the airline business and work without gloves and I put this ring through hell day in and day out and is like brand new, I'm extremely pleased and best of all I don't even know I have it on until I look at it!!! Looks great feels great and stays great I highly recommend this most gorgeous piece of wonder. We love the ring, we absolutely cannot believe the value for the price. The ring looks and feels absolutely wonderful. The sizing is perfect, engraving I asked for is great. Love it, thank you! It is heavy duty. I do not normally wear a watch or rings, but I tried this one anyway. It is thick and has a bold width, so it comes of as very masculine unlike many rings that fail in that area. this ring is awesome. make sure you get size to fit. I love it and wear it everyday! I love the mil.camo ring, looks good feels great. My husband really likes this ring. I bought it for him for Christmas. I was very impressed at how fast it was shipped and delivered. I truly wasn't expecting it to be here in time due to my late ordering. I have not been disappointed with any of my purchases! ?? Great ring! Fit was true to size and comfortable, as advertised. Will definitely do business again....very good customer support & communication regarding delivery, etc. The sizing chart and the ring fit was perfect. The feel of the ring on my finger is comfortable and the ring width is just right. I've had several complimentary comments from others for the look and style of the ring. I absolutely love this ring! My fiance loved it. People have asked her where she got it, because it is so unique. She is in the Army, and we recently got engaged. (10/30/15) This ring is so beautiful! thank you so very much! Super happy w/ the quality! I was definitely pleased with my rings. Quality is outstanding. They look exactly like the picture but it is better in person. Lovem! Very happy with the ring and how fast they exchanged it. My fiancé was sized at the jewelry store at a 16.5 which you can imagine is not an easy ring size to find when shopping for a wedding band. When it arrived it was slightly small. Customer service was great, helping me decide what new size to order. Within a few days they received my ring I sent in and that same day sent out the new one. Overall happy with the ring and the customer service. Highly recommend. Exactly what he was expecting and wanting.